If you like this post, you might like a new post I have written on using the DEC’s Literacy Continuum to inform our Data Wall. This is the newest version of our whole-school literacy initiative. Here is the link. Three years ago, after interpreting our NAPLAN literacy results, we decided to implement a whole-school literacy initiative to improve our students’ ability to write effectively and their use of language conventions. We hoped that a whole-school focus might help support the students in their ability to construct texts, and improve their use of grammar, spelling and punctuation. While we could have adopted a writing program available on the market, we decided that we wanted to develop our own approach to writing, with a focus on paragraph writing. One of the main reasons for this was that we had noticed that the language ou students used when referring to the structure of their work was inconsistent. What one teacher called a topic sentence, another teacher called a thesis statement an another an opening remark. So we developed our own approach, which we termed Higher Order Thinking Paragraphs, or HOT Paragraphs. We wrote a program and built resources for our teachers to support them as they implemented this approach in their classrooms. We provided time for them to use the resources we had provided to create their own subject-specific examples and to write subject-specific questions and modelled responses to those questions. All of this formed a part of the work we were doing in our Professional Learning Teams (PLTs). These a cross curricular teams of teachers that meet fortnightly for 100 minutes of professional learning. What we did slightly differently this year, was to combine what we were already doing with our HOT Paragraphs in our PLTs with the use of the Data Teams process. This process seeks to measure student data over time, revising our goals for different groups of students in the classroom based on their performance. We decided that each teacher would focus on one particular class they taught for this program. 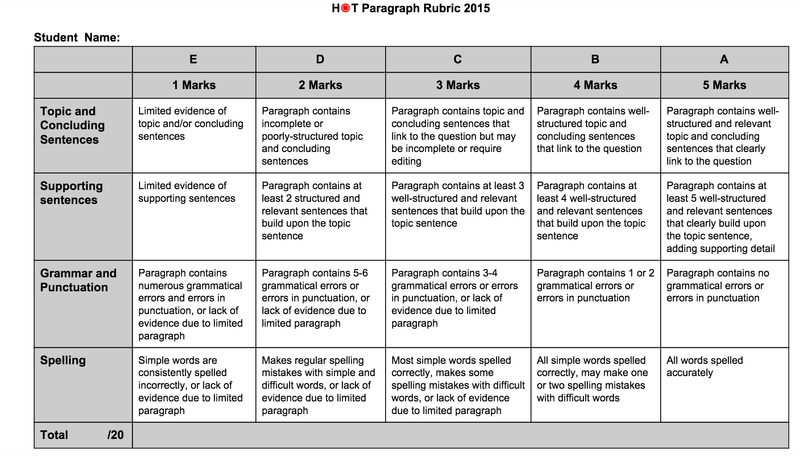 Our first task was to have students write a paragraph without any explicit teaching of the HOT Paragraph structure. We hoped that this would provide us with a baseline for the data we were collecting, so we could see the impact of the HOT Paragraph interventions. This year, we marked these paragraphs prior to attending our PLTs, so we could discuss the specific needs of our students in more detail during the PLT session. We recorded our data in Google Sheets, so all teachers could reflect on each others’ data. We also created a graph for each student so we could visually see their progress throughout the HOT Paragraph focus. We then looked at the strengths and weaknesses for each band level of students. This was a useful process as it allowed us to recognise that not all students in our classrooms had the same needs and that our interventions needed to be differentiated. This allowed us to then determine which intervention strategies would be the most appropriate for us to implement with our classes in the following fortnight. Below is the Strengths and Weaknesses Google Sheet we used. 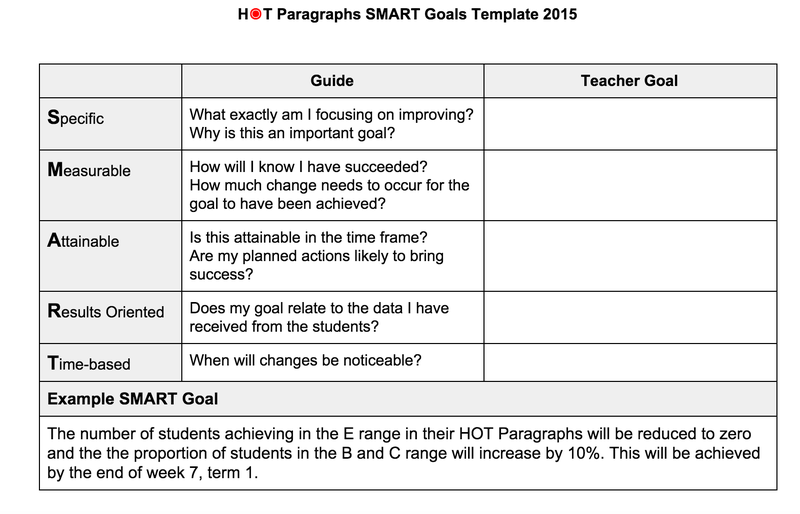 Based on our interpretation of the strengths and weaknesses, we set SMART goals for our students. We wanted to have something specific to aim towards for our classes so we would know whether our intervention was successful. Below is the Google Sheet we used to help us set our goals for our classes. We used what we have learned about our students’ strengths and weaknesses to explicitly teach paragraph writing to our students, using the resources we had already created. Students were exposed to the lexicon we wanted them to use, gained an understanding of the elements required in a paragraph and were provided with practice questions. We continued this cycle for the remainder of the PLTs. Each session we charted our data, we examined our students’ work, looked for strengths and weakeness, set revised SMART goals and planned the next fortnight’s interventions. The discussions were incredibly fruitful and allowed us to spend quality time looking deeply at our students’ work. 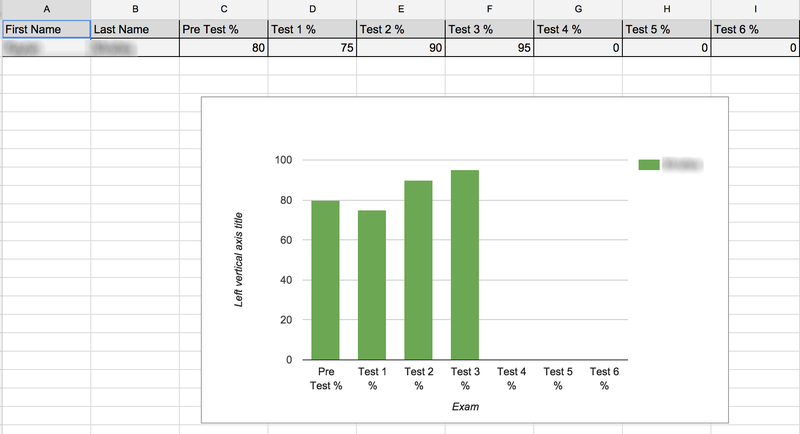 Below is an example of one class’ Google Sheet, with their marks and percentages for each HOT Paragraph iteration. We have seen some success with the use of HOT Paragraphs. In the first two years, we saw growth in our Yr 7 and 9 cohorts in the NAPLAN examinations, predominantly in the language conventions: spelling, grammar and punctuation. We think that we can attribute much of this to the focus that the HOT Paragraphs places on these elements, as well as the fact that our teachers felt more comfortable addressing these elements with their students then perhaps they did with sentence or paragraph structure. We also saw generally positive growth in most class data sets. Although this is not a completely objective instrument for measuring the efficacy of the work we have done, I think it still provides us with some positive take aways. Below are some examples of individual student graphs. Although this process certainly has its limitations and drawbacks, I think that over the past three years we have been met with some considerable success. 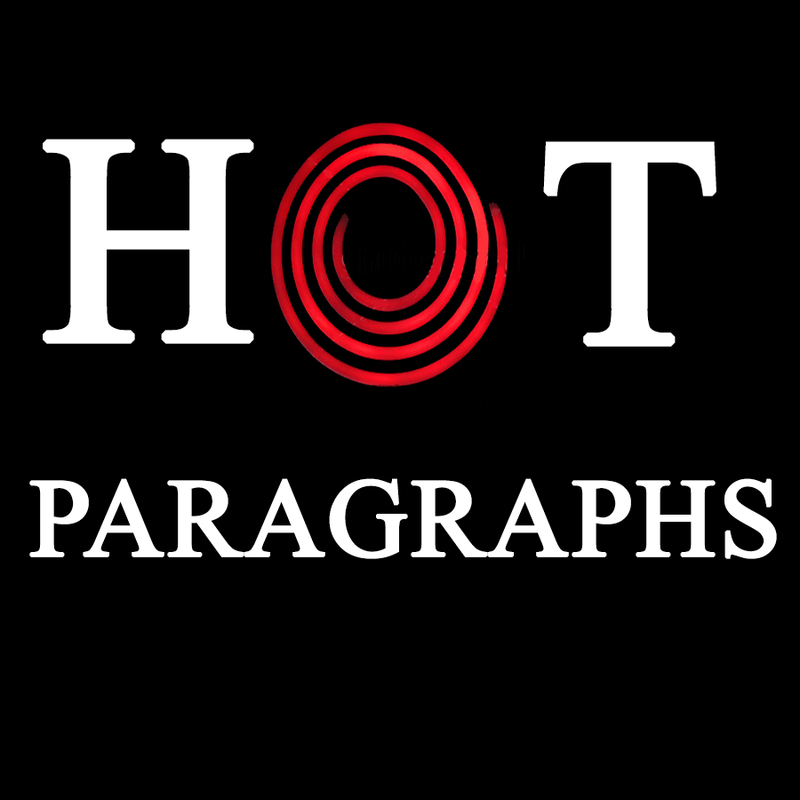 HOT Paragraphs and the language we use to describe paragraph writing has now become a part of our school vernacular. As a result, HOT Paragraphs are no longer something that we ask our students to complete when it is a PLT focus. It has become the default approach to written responses for our school, helping to ensure that there is consistency among staff when we discuss our writing. I think that for us, HOT Paragraphs are here to stay. Reblogged this on Create Great Schools. Thanks for the reblog Mark.